In many sectors technological disruption and uncertainty is dampening growth and creating paralysis. A notable exception is FinTech which in many respects is benefiting from disruption. Fidelio is pleased to be supporting agile, fast growing companies in the sector to build leadership teams well placed for the future. In this Overture we set out some of the opportunities which are driving growth in the sector, as well as the skill sets and experience required to overcome the challenges and risks. As FinTech matures, the winners will be those companies that achieve a balance between entrepreneurialism and an ability to provide oversight and regulatory responsibility. This balance of skills at Board and Executive level is key for FinTech companies seeking to secure growth and navigate complexity. The FinTech governance challenge is to build the right expertise at both Executive and Board levels, retaining entrepreneurial flair while ensuring regulatory compliance. 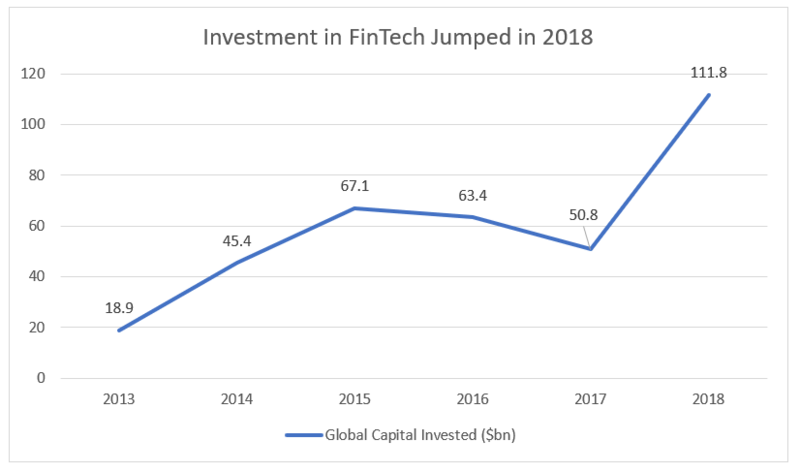 2018 may well have been the year in which the FinTech sector came of age, with a record $111.8bn invested in the sector globally through Venture Capital, Private Equity and Merger and Acquisition activity. The total was driven by just three big deals – the acquisition of Worldpay by Vantiv; the purchase of 55% of Refinitiv (formerly the financial and risk business of Thomson Reuters) by Blackstone group; and by Ant Financial’s record-breaking fundraising round – but sector activity is global in nature and shows no sign of slowing down. It’s also attracting a lot of interest from bright young people who are looking to build their careers, and has become a real magnet for some of the best talent. The reason for all this investor enthusiasm is clear – the potential for technology to improve financial services and reduce costs in the sector is exciting. Incumbent institutions have typically been slow to offer online and smartphone-based innovations, and tend also to suffer from legacy back-office systems which have built up over many years and are often the result of multiple acquisitions. In many cases the financial plumbing is not fit for purpose, and has a disconcerting tendency to “leak” if efforts are made to improve it. This is reflected in the number of larger banks experiencing some form of technology meltdown, which can clearly have negative consequences for customer service. FinTech companies by contrast have a structural advantage in that they can build their systems from scratch using the latest technologies – which are typically more modular and easier to adapt and scale than legacy architectures. From a consumer point of view this results in secure easy to use mobile banking apps, faster and more convenient payments, and increasingly innovative use of the reams of data generated to track spending – which also creates opportunities for cross-selling. A number of companies are also trying to bridge the financial advice deficit by offering “robo-advisors” for savings and pensions, thought it’s unclear whether these will address the core problem of defined contribution pensions, namely that most people are simply not saving enough. While the opportunity in FinTech is undisputed, there are also the headwinds that come with operating in uncharted territory, and agile, ambitious companies need to build effective leadership teams with the ability to manage growth but also risk. There has been recent evidence from a number of companies that the course of FinTech growth is not always straightforward. This is, of course, no surprise to anyone who has ever been involved with startups in whatever industry, but the issues are perhaps more acute in a sector whose aim is to disrupt, challenge and create value in the highly-regulated business of finance. We have seen a UK challenger bank affected by an accounting error in the risk classification of assets, with the necessary re-classification of certain loans resulting in an urgent need for a capital increase. In addition the company’s governance has come under fire from investors with a number of directors falling foul of the UK corporate governance code’s nine-year maximum tenure rule. Meanwhile, another UK digital bank has been criticised for misleading statements in adverts that imply it has even more intimate knowledge of its customers’ spending patterns than it does in reality: surely an error / oversight to be avoided as the “techlash” against Facebook and Google’s consumer data-based business models momentum. The same bank also faced questions from its regulator over an alleged failure to be entirely transparent concerning the potential disabling of anti-money-laundering systems. And in Germany we have also seen a specialist payments provider come under pressure as a result of allegations of false accounting and money laundering in Singapore and elsewhere in Asia. Investigations are still under way, but investor sentiment has soured, and such is the short interest in the stock that it has become the subject of a ban on short-selling. It could be argued that it’s the nature of digital disruptors to sail close to the wind since, in many cases, their business model is based on providing services in a radical way which can challenge existing regulatory categories. Is Uber a taxi company or merely a platform? And is AirBnB a rentals agency, a hotel substitute, or simply a marketplace? In both these cases the view of the relevant regulator is key, and as Uber has found, an adverse ruling threatens to exclude them from large and potentially lucrative markets. And while financial innovation clearly represents progress and has already delivered substantial improvements in the quality of financial services, it can be subject to the law of unintended consequences. The Financial Crisis of 2007/8 had its genesis in financial innovations aimed at making it easier for people to buy their own homes: when these got out of control the result was global recession, as well as the tighter regulation we see today. Risk control is critically important in Financial Services due to the contingent nature of many financial assets, the highly-leveraged balance sheets of institutions, and their systemic importance to the economy. As a consequence, a systematic approach to regulatory compliance is essential: there is much less scope for sailing close to the wind than there is less heavily regulated sectors. And this has clear implications for the composition and skill set of the FinTech leadership team. In order to retain a competitive edge and also weather the regulatory hurdles, FinTech needs to be able to marry two skills sets: (i) a high degree of entrepreneurialism and (ii) regulatory and corporate maturity. This plays out at Board and Executive level. It’s essential that FinTech companies have the right team in place to deal with all the challenges they face, in particular the regulatory ones. Ironically many more traditional sectors crave the agility and dynamism of FinTech, while FinTech in turn benefits from the maturity and systematized frameworks and approach of more established industries. The skill of the Chair and CEO is to build teams at both Board and Executive level that combine both old and new economy skills. Global corporates struggle with innovation; FinTech lives and breathes innovation. But major corporates have become skillful at dealing with stakeholders including the regulator. The Board Director or Executive who comfortably spans both worlds is rare. The prize for combing these skills is considerable. At Board and Executive level deep expertise is required – a firm grasp of the industry and technology; experience of high growth and the issues it raises including ensuring appropriate motivation and alignment of interest and risk; a mature understanding of regulation and the ability to think through the implications of innovative business models. This also holds true for privately held companies that are not contemplating an IPO. Here too the Board must have the right level of experience to deal with regulators, risk management and public opinion. As a consequence, Fidelio is seeing wise FinTech firms pre-emptively strengthening their risk management capability as well as stakeholder engagement at Board and Executive level. Moreover good governance isn’t optional – as Fidelio has argued before, it’s never too early for startups to put the right structures in place at so that as their business matures they become more stable and predictable and sustainable for all their stakeholders. For more information about how Fidelio can help build your FinTech team, through Search or Evaluation, please contact Mark Cumberlege on mcumberlege@fideliopartners.com.